Anti-epidermal growth factor receptor (EGFR)-monoclonal antibodies (MoAbs) have been widely used in a variety of malignancies. Severe infections (≥grade 3) are potentially life-threatening adverse events with these drugs. However, the contribution of anti-EGFR MoAbs to infections is still unknown. We performed this meta-analysis to determine the overall incidence and risk of severe infections in cancer patients treated with these drugs. The databases of PubMed and abstracts presented at oncology conferences and published in the proceedings were searched for relevant studies from January 2000 to May 2014. Summary incidences, relative risks (RRs) and 95% confidence intervals (CIs) were calculated by using either random effects or fixed effect models according to the heterogeneity of included studies. A total of 14,066 patients from 26 randomized controlled trials (RCTs) were included. The use of anti-EGFR-MoAbs significantly increased the risk of developing severe infections (RR 1.34, 95%CI: 1.10 to 1.62, P = 0.003) in cancer patients, but not for fatal infections (RR 1.62, 95%CI: 0.81 to 3.26, P = 0.18). Meta-regression indicated the infections might possibly occur early in the treatment with anti-EGFR MoAbs. On sub-group analysis, the risk of severe infections significantly varied with tumor type (P = 0.001). When stratified by specific anti-EGFR MoAbs, a significantly increased risk of infections with cetuximab was observed (P <0.001), but not for panitumumab (P = 0.98). Additionally, the use of anti-EGFR MoAbs significantly increased the risk of severe infections when used in conjunction with cisplatin (RR 1.48, 95%CI 1.22 to 1.79, P <0.001) or irinotecan (RR 1.53, 95%CI 1.12 to 2.10, P = 0.008). When stratified by specific infectious events, anti-EGFR-MoAbs significantly increased the risk of developing severe sepsis (RR 4.30, 95%CI: 1.80 to 10.27; P = 0.001). Anti-EGFR MoAbs treatment significantly increases the risk of developing severe infectious events in cancer patients. The risk may vary with tumor types. Clinicians should be aware of the risks of severe infections with the administration of these drugs in cancer patients. The epidermal growth factor receptor (EGFR) signal pathway plays an essential role in tumor proliferation, differentiation, anti-apoptosis and metastasis -. For this reason, EGFR and the process of its receptor binding are regarded as attractive therapeutic targets in the treatment of cancers. Currently, two monoclonal antibodies (MoAbs) targeted at EGFR, the chimeric immunoglobulin G1 (IgG1) MoAb cetuximab and the fully humanized IgG2 MoAb panitumumab, have shown a relevant clinical effect in the treatment of a variety of malignancies. Cetuximab has been approved by the US Food and Drug Administration (FDA) for the treatment of metastatic colorectal cancer  and recurrent or metastatic head and neck cancer . Panitumumab is approved by the FDA for the indication of advanced colorectal cancer . In contrast with traditional chemotherapy agents, anti-EGFR-MoAbs do not usually produce systemic toxicities such as nausea, vomiting, diarrhea, alopecia, and bone marrow suppression. However, anti-EGFR-MoAbs exhibit some unique toxicities including rash ,, hypomagnesemia -, hypokalemia  and venous and arterial thromboembolic events . Specifically, severe infections (≥grade 3) are reported in both cetuximab and panitumumab trials as a common side effect, as a cause of treatment disruption, and in some cases led to fatalities -. However, to the best of our knowledge, the incidence and risk of severe infections with these drugs have not been systematically defined. Therefore, we performed this up-to-date meta-analysis of randomized controlled trials to determine whether the addition of anti-EGFR-MoAbs to therapies increases the risk of severe and fatal infections in cancer patients. We searched the PubMed (data from 2000 to May 2014), Embase (data from 2000 to May 2014) and the Cochrane Library electronic databases. Key words were `cetuximab’, `Erbitux’, `panitumumab’, `Vectibix’, `cancer’, `carcinoma’, `neoplasm’, `randomized controlled trial’ and `infections’. The search was limited to prospective randomized clinical trials published in English. We also searched abstracts containing the term `cetuximab’ and `panitumumab’ that were presented at the American Society of Clinical Oncology (ASCO) and European Society of Medical Oncology (ESMO) annual meetings from 2004 to 2014 to identify relevant studies. Additionally, we searched the clinical trial registration website  to obtain information on registered prospective trials. Each publication was reviewed and in cases of duplicate publications only the most complete, recent and updated report of the clinical trial was included in the meta-analysis. The primary goal of our study was to determine the overall incidence of severe and fatal infections (≥grade 3) associated with approved anti-EGFR-MoAbs (cetuximab and panitumumab) and establish the association between treatment with anti-EGFR-MoAbs and the risk of developing severe and fatal infections. Thus, only prospective randomized controlled phase II and III trials evaluating approved anti-EGFR-MoAbs (cetuximab and panitumumab) in cancer patients with adequate data on severe or fatal infections were incorporated in the analysis. Phase I and single-arm phase II trials were excluded due to lack of control groups. Clinical trials that met the following criteria were included: (1) prospective randomized controlled phase II or III trials involving cancer patients; (2) participants assigned to treatment with or without approved anti-EGFR-MoAbs (cetuximab and panitumumab) in addition to concurrent chemotherapy, radiotherapy or biological agent; and (3) available data regarding events or incidence of severe or fatal infections and sample size. Data abstraction was conducted independently by two investigators (WXQ and SF), and any discrepancy between the reviewers was resolved by consensus. For each study, the following information was extracted: first author’s name, year of publication, phase of trials, number of enrolled subjects, treatment arms, number of patients in treatment and control groups, underlying malignancy, median age, median treatment duration, median progression-free survival, median overall survival and adverse outcomes of interest (severe and fatal infections). The following adverse outcomes were considered as infectious events and were included in the analyses: infections (not specified), febrile neutropenia, sepsis, septic shock, and pneumonia. Adverse events of severe infections (≥grade 3), as assessed and recorded according to the National Cancer Institute’s common terminology criteria (NCI-CTC) version 2 or 3 , which has been widely used in cancer clinical trials, were extracted for analysis. For the calculation of incidence, the number of patients with infections in the anti-EGFR-MoAbs group and the total number of patients receiving anti-EGFR-MoAbs were extracted from the selected clinical trials; the proportion of patients with infections and 95% confidence interval (CI) were derived for each study. To calculate relative risk (RR), patients assigned to anti-EGFR-MoAbs were compared only with those assigned to control treatment in the same trial. For one study that reported zero events in the treatment or control arm, we applied the classic half-integer correction to calculate the RR and variance . We also conducted the following pre-specified subgroup analyses to find the potential risk factor of infections: tumor types, anti-EGFR-MoAbs, concomitant therapies and phase of trials. To assess the stability of results, sensitivity analysis was performed by sequential omission of individual studies. Additionally, to test whether effect sizes were moderated by differences in length of treatment, we have carried out meta-regressions with the difference in median length of experimental treatments (expressed in weeks) as the predictor and RR as the dependent variable. Between-study heterogeneity was estimated using the χ2-based Q statistic . Heterogeneity was considered statistically significant when P heterogeneity <0.1. If heterogeneity existed, the pooled estimate calculated based on the random-effects model was reported using the DerSimonian et al. method . In the absence of heterogeneity, the pooled estimate calculated based on the fixed-effects model was reported using the inverse variance method. A statistical test with a P-value less than 0.05 was considered significant. The presence of publication bias was evaluated by using the Begg and Egger tests . All statistical analyses were performed by using Version 2 of the Comprehensive MetaAnalysis program (Biostat, Englewood, NJ, USA) and Open Meta-Analyst software version 4.16.12 (Tufts University, Medford, MA, USA). Our search yielded 190 clinical studies relevant to cetuximab and panitumumab. After excluding review articles, phase I studies, single-arm phase II trials, case reports, editorials, meta-analyses and systematic reviews (Figure 1), we selected 26 randomized controlled trials (RCTs), which included 17 phase III and 9 phase II trials. A total of 14,060 patients from 26 RCTs were included for analysis. The characteristics of the patients and studies are listed in Table 1. According to the inclusion criteria of each trial, patients were required to have adequate hepatic, renal and hematological function. Underlying malignancies included colorectal cancer (eleven trials) ,,-, non-small-cell lung cancer (seven trials) -, head and neck cancer (four trials) ,,,, breast cancer (one trial) , urothelial carcinoma (one trial) , pancreatic cancer (one trial)  and esophagogastric cancer (one trial) . Selection process for prospective randomized controlled trials included in the meta-analysis. Bev, bevacizumab; BSC, best support care; CRC, colorectal cancer; DDP, cisplatin; Doc, docetaxel; FOLFIRI, folinic acid (leucovorin), fluorouracil and irinotecan; FOLFOX, folinic acid (leucovorin), fluorouracil and oxaliplatin; Fu, fluorouracil; MBC, metastatic breast cancer; NR, not reported; NSCLC, non-small-cell lung cancer; NVB, vinorelbine; OS, overall survival; PTX, paclitaxel; PFS, progression free survival. For calculating the incidence of severe infections, a total of 6,446 patients from 26 RCTs who received anti-EGFR-MoAbs were included for analysis. Using a random-effects model, the summary incidence of severe infection was 8.1% (95%CI, 6.0 to 10.9%). In addition, severe infections can be fatal in many instances. A total of 5,239 patients from 16 RCTs were included for analysis of fatal infections. Fatal infections occurred in 24 patients, representing a total incidence of 0.8% (95%CI: 0.5% to 1.2%). Among patients with anti-EGFR MoAbs-associated severe infections, meta-analysis showed that the mortality of severe infections associated with anti-EGFR MoAbs was 4.0% (95%CI: 2.7 to 5.9%). To determine the specific contribution of anti-EGFR MoAbs to the development of infections and to exclude the effect of any confounding factors, we calculated the overall RR of infections from these RCTs. For calculating RR of severe infections, 26 RCTs, representing 14,060 patients, were included. Among the 6,446 patients treated with anti-EGFR MoAbs, 601 presented with severe infections, whereas 438 of 6,359 patients in control groups had a severe infectious event. This conferred an overall RR of developing severe infections of 1.34 (95%CI, 1.10 to 1.62; P = 0.003; Figure 2). Significant heterogeneity was observed in the RR analysis of severe infectious events (Q = 44.99; P = 0.006; I 2 = 46.7%). Considering fatal infectious events, 24 of 5,239 patients treated with anti-EGFR MoAbs and 11 of 4,940 patients in control arms experienced a fatal infection. This conferred an overall RR of 1.61 (95%CI, 0.81 to 3.25; P = 0.18). No significant heterogeneity was observed in the RR analysis of fatal infections (Q = 6.64; P = 0.88; I2 = 0%). We also performed a sensitivity analysis to examine the stability and reliability of pooled severe RRs by sequential omission of individual studies. The results indicated that the significance estimate of pooled severe RRs was not significantly influenced by omitting any single study (Figure 3). Additionally, a meta-regression analysis was carried out to test whether the RR of severe infections varied as a function of difference in the length of the experimental treatments. The result indicated that the RR of severe infections tended to be lower in the study in which the experimental treatment was longer, and this effect was statistically significant (P = 0.02, Figure 4). 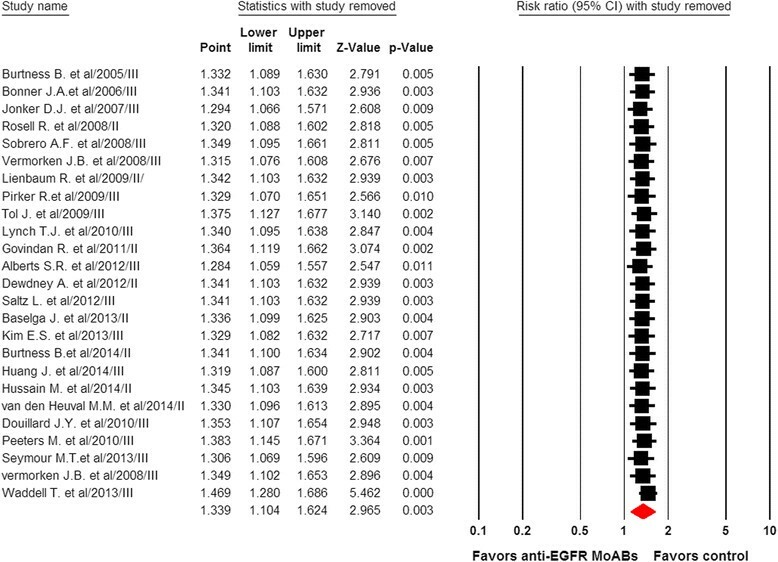 Relative risk of severe infections associated with anti-EGFR MoAbs versus control. EGFR, epidermal growth factor receptor; MoAbs, monoclonal antibodies. 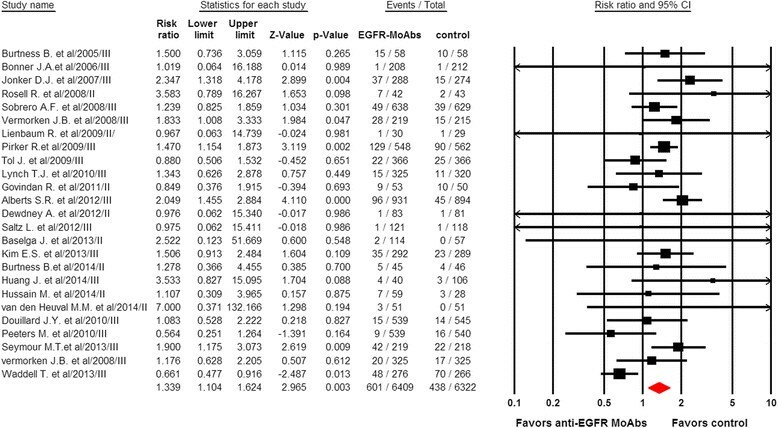 Meta-analysis of severe infections associated with anti-EGFR MoAbs versus control: `leave-one-out’ sensitivity analysis. EGFR, epidermal growth factor receptor; MoAbs, monoclonal antibodies. Meta-regression analysis of trends between treatment duration and severe relative risk: symbols: each study is represented by a circle the diameter of which is proportional to its statistical weight. To determine whether the observed increase in RRs of developing severe infections was the result of confounding bias, we performed subgroup analyses according to the underlying malignancy, anti-EGFR-MoAbs, concomitant drugs and phase of trials. When stratified by tumor types, a significantly increased risk of severe infections was observed in colorectal cancer (RR1.42, 95%: 1.05 to 1.93, P = 0.024), non-small-cell lung cancer (RR1.45, 95%: 1.19 to 1.77, P <0.001) and head and neck cancer (RR1.48, 95%: 1.02 to 2.13, P = 0.037), while the risk of severe infections was decreased in other tumor types (RR 0.72, 95%CI: 0.53 to 0.97, P = 0.033, Table 2). In addition, significant differences in RRs of severe infections were found among these tumor types (P = 0.001). However, clinicians should be cautious when interpreting these results due to limited RCTs of other tumor types included for the RR calculation. CI, confidence interval; CRC, colorectal cancer; EGFR, epidermal growth factor receptor; MoAbs, monoclonal antibodies; NA, not available; NSCLC, non-small-cell lung cancer; RR, relative risk. The risk of severe infections might be related to different anti-EGFR MoAbs. Our results demonstrated that the use of cetuximab significantly increased the risk of severe infections (RR 1.52, 95%CI: 1.33 to 1.75, P <0.001), while the use of panitumumab did not increase the risk of severe infections (RR 0.99, 95%CI: 0.62 to 1.60, P = 0.98). Then, we also carried out a subgroup risk analysis stratified according to concomitant therapies with anti-EGFR-MoAbs. A significantly increased risk of severe infections with anti-EGFR-MoAbs was observed when used in conjunction with cisplatin (RR 1.48, 95%CI: 1.22 to 1.79, P <0.001) and irinotecan (RR 1.53, 95%CI: 1.12 to 2.10, P = 0.008), while anti-EGFR-MoAbs in combination with oxaliplatin (RR 0.97, 95%CI: 0.58 to 1.61, P = 0.90) and radiotherapy (RR 0.99, 95%CI: 0.47 to 2.10, P = 0.98) did not increase the risk of severe infections. However, no significant difference in RRs of severe infections was found among these concomitant therapies (P = 0.30). Additionally, we did sub-group analysis according to the phase of trials (phase II versus phase III). Patients from phase III trials had an RR of 1.34 (95%CI: 1.08 to 1.67, P = 0.008), while patients from phase II studies had an RR of 1.26 (95%CI: 0.75 to 2.12, P = 0.39, Table 2). Individual specified and non-specified causes of severe and fatal infections are listed in Table 3. Of those severe infections that were specified, the most common events for severe infections were febrile neutropenia (47.8%). We then calculated the risk of severe infections stratifying trials according to specific type of infections. Our results showed that the use of anti-EGFR MoAbs significantly increased the risk of severe sepsis (RR 4.30, 95%CI: 1.80 to 10.27, P = 0.001), while a non-significantly increased risk of febrile neutropenia (RR 1.09, 95%CI: 0.86 to 1.38, P = 0.68) and pneumonia (RR 1.11, 95%CI: 0.72 to 1.70, P = 0.64) was observed. Of the 24 fatal infections on the treatment arms and 11 fatal infections on the control arms, 33.3% and 18.2% were of non-specified etiology, respectively. Of those fatal infections that were specified, the most common events for fatal infections were sepsis (37.5%). When we calculated the risk of fatal infections, stratifying trials according to specific types of infections, a non-significantly increased risk of pneumonia (RR 1.46, 95%CI: 0.39 to 5.48, P = 0.56) and sepsis (RR 1.54, 95%CI: 0.50 to 4.74, P = 0.45) was observed (Table 3). CI, confidence interval; EGFR, epidermal growth factor receptor; MoAbs, monoclonal antibodies; RR, relative risk. No publication bias was detected for the primary endpoint of this study (RR of severe infections) by the funnel plot (Figure 5), Egger’s test and Begg’s test (RR of severe infections: Begg’s test P = 0.98; Egger’s test P = 0.73). 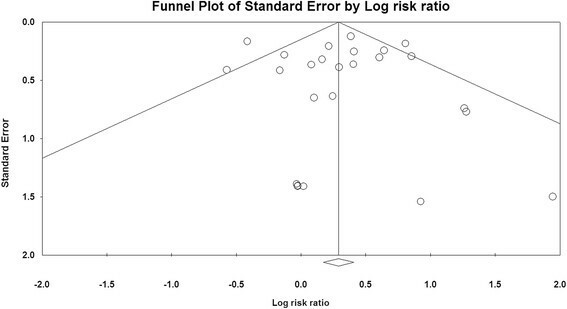 Funnel plot of standard error by log-odds ratio for severe infections. Infections are emerging complications of many MoAbs and concerns have arisen regarding the risk of infections with the use of these drugs. In 2007, Rafailidis et al. 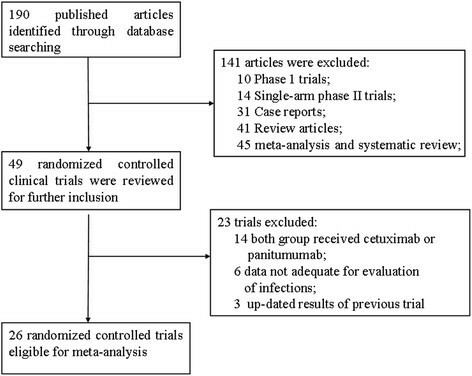 performed a systematic review to investigate the incidence of infectious complications of several MoAbs including trastuzumab, alemtuzumab, bevacizumab, cetuximab and rituximab. Based on a single trial, there was a higher rate of severe infections in patients receiving cetuximab. Then, Lee et al. in 2012 conducted a national cohort study of 1,083 head and neck cancer patients and found that cetuximab therapy was not statistically associated with an increased infection rate in head and neck cancer patients. As a result, the incidence and risk of infections associated with anti-EGFR MoAbs has not been well defined. Our meta-analysis includes a total of 14,060 patients from twenty six RCTs investigating anti-EGFR MoAbs for the treatment of cancers. To the best of our knowledge, this is the first large study of RCTs demonstrating a significant increase in the risk of severe infections (≥grade 3) with the use of anti-EGFR MoAbs in cancer patients. Our analysis finds that the risk of developing a severe infection is 1.34-fold higher in patients treated with anti-EGFR MoAbs, while the use of anti-EGFR MoAbs does not significantly increase the risk of fatal infections. Sensitivity analysis indicates that the significance estimate of pooled RRs of severe infection is stable and reliable. We also performed a meta-regression analysis to investigate the association between cumulative anti-EGFR MoAbs exposure and severe infections. The result indicates that severe infections might possibly occur early in the treatment with anti-EGFR MoAbs. In contrast with our result, the study conducted by Burtness et al. showed that the increased risk of neutropenia with cetuximab/cisplatin compared with placebo/cisplatin was associated with longer duration of therapy. As a result, further prospective studies are still needed to address this issue. We also investigated the outcome of anti-EGFR MoAbs-associated severe infections. Our study shows that the overall incidence of fatal infections with anti-EGFR MoAbs is 0.8%. Given that the absolute risk of fatal infections is low, the use of anti-EGFR-MoAbs should be considered in the context of overall survival benefits. Because anti-EGFR MoAbs are increasingly used in cancer patients, it is particularly important for all health care practitioners and patients to understand and recognize the risk of severe and fatal infection. Because risk factors for severe infections with anti-EGFR MoAbs are poorly understood, we carried out a subgroup analysis to identify potential risk factors for anti-EGFR MoAbs related-infections. When stratified by tumor type, a significantly increased risk of severe infections with anti-EGFR MoAbs is observed in colorectal cancer, non-small-cell lung cancer, and head and neck cancer. Interestingly, no increased risk of severe infections is observed in patients with other tumor types receiving anti-EGFR MoAbs. The risk of severe infections varies significantly with different tumor types (P = 0.001), reflecting the nature of the underlying tumor biology or associated treatment. Notably, our study shows that anti-EGFR MoAbs significantly increase the risk of severe infections when used in conjunction with cisplatin or irinotecan. This result may reflect an interaction between anti-EGFR MoAbs and certain chemotherapeutic agents in causing severe infections. However, the risk of severe infections dose not significantly vary with concomitant therapies (P = 0.30). We also performed sub-group analysis according to anti-EGFR MoAbs and demonstrated that the use of cetuximab significantly increases the risk of severe infections, but this was not the case with panitumumab. Additionally, no significant differences in the risk of severe infections with anti-EGFR MoAbs were observed according to the phase of the trials. Based on our findings, the following approaches may be considered to reduce the association of anti-EGFR MoAbs with risk of severe infections. Before the initiation of anti-EGFR MoAbs, clinicians must fully treat patients with any active infection and must monitor patients during the course of anti-EGFR MoAbs treatment. Clinicians should be cautious when adding anti-EGFR MoAbs to the therapies for the treatment of colorectal cancer, non-small-cell lung cancer, and head and neck cancer, especially when used in conjunction with cisplatin or irinotecan. Despite the size of this meta-analysis, our study has several limitations. First, all included studies were conducted at major academic institutions among patients with adequate major organ function and may not reflect the general patient population in the community or patients with organ dysfunction. It is conceivable that the true incidences and risk of treatment-related infections from this study may be underestimated. Second, these studies were conducted at various institutions by different investigators internationally and may have potential bias in reported incidences or specification of severe infections. Severe infections are not primary outcome measures in the included studies. The reported incidence of severe infections has significant heterogeneity among the included studies. Nevertheless, we attempted to adjust for the heterogeneity using a random-effects model to calculate the incidence of severe and fatal infections. Third, our study shows that the RR of fatal infection is higher in patients receiving anti-EGFR MoAbs than in controls, but is not statistically significant. This observation might be limited by sample size. Finally, this is a meta-analysis at study level; therefore, confounding factors at the patient level cannot be assessed properly and incorporated into the analysis. In conclusion, this study has demonstrated that the addition of anti-EGFR MoAbs to concurrent antineoplastic therapy is associated with an increased risk of severe infections in cancer patients. The use of cisplatin or irinotecan may increase the risk of severe infections associated with anti-EGFR MoAbs. The increased risk of severe infections associated with anti-EGFR MoAbs may vary with tumor types. Early detection and effective management of infections that can occur with anti-EGFR MoAbs is crucial for safer use of this drug. Further studies are still recommended to investigate risk reduction and the possible mechanism of anti-EGFR MoAbs induced infections. Concept and design: XMG and SF. Search and collection of data: XMG and SF. Analysis of data and interpretation: QZ and XMG. Tables and figures: WXQ. Writing the manuscript and review: WXQ and SF. All authors read and approved the final manuscript.